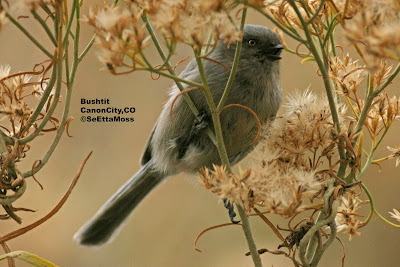 I took these pics of a female Bushtit (females have light eyes) as it foraged in a large patch of rabbitbrush. I am really proud of how nice these came out as they are handheld. I think these pics compete well with the top pics on the internet (via google) that were taken at feeders, which provide more stable photo conditions than I had as I followed this and the other Bushtits in the flock as they moved up & down, & back & forth, upside down through the vegetation. 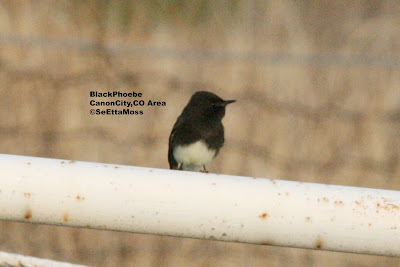 Last week this Black Phoebe paid a visit to my friend's place, just east of Canon City along the Arkansas River, the location where many Black Phoebes have visited, foraged and bred over the past 10 or so years. Unfortunately it was late in the afternoon when I visited my friend so the light was not good for photographing this bird so I was quite pleased to catch the middle pic of the phoebe in flight with a good view of it's fanned tailed feathers. Boy, am I behind on posting my pics. I took this pic of several of the 9 adult plumaged and 2 juvenal plumaged Greater White-fronted Geese in early November. 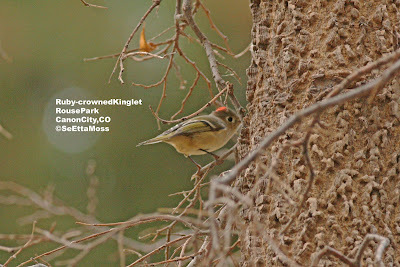 We regularly have 5-10 or so of these guys every winter and they hang out in the same places--makes me think that some of them are the same birds returning from year to year and likely bringing their offspring. The following is from Cornell Lab's All About Birds website:"As is true of many geese, Greater White-fronted Goose pairs stay together for years and migrate together, along with their offspring. 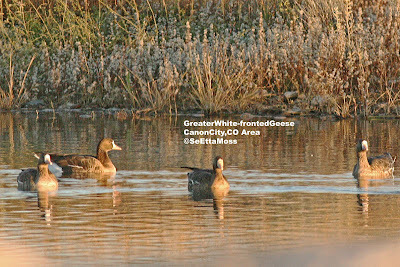 White-front family bonds can last longer than in most geese, and some young stay with their parents through the next breeding season. Parent and sibling associations may continue throughout their lives."